The disc can heal in the appropriate environment. It is our job to help create that environment so you can regain your health. We not only focus on the location of the problem, but we also treat from the feet up. Your feet and everything above contribute to the forces that translate through the disc during walking. Our everyday steps add up quick, and when the system doesn’t dampen the forces correctly, it shows as tight and tender muscles that overtime cause injury. Taking the stress of the disc, will help allow it to heal appropriately. opens the vertebral canal by 2 mm or 3.5 to 6mm. Our patient named Jim had tried everything to overcome the pain and disabling features that accompanied a disc herniation. He had steroid shots, acupuncture, physical therapy, traction, chiropractic, massage, epidural steroid injections, and had changed many of his bad postural habits to no avail. In the face of defeat, he thought he had tried everything until he landed in our clinic. We suggested that he try flexion-distraction therapy. He had never heard of flexion-distraction therapy, but he had come to our clinic based on our awesome Denver chiropractor Yelp reviews. Jim’s luck had finally changed, and in the course of three weeks, his pain was cut in half. He was also able to exercise more and avoid a costly and scarry surgery. In end, Jim had a very positive response to our disc herniation therapy. Jim’s story is similar to many peoples stories that are suffering from disc herniations, stenosis, facet syndrome, degenerated discs, and spondylosis. 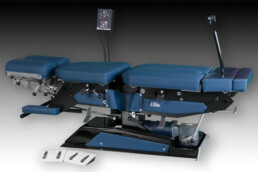 Jim’s success is not only due to Flexion-distraction therapy alone, but due to a careful combination of our services. Research has shown that there is no difference between surgical and conservative treatment after 2 years with acute disc herniations. The intensity of pain and severity of disability will help determine which path you choose for disc herniation relief. Flexion-Distraction is a unique form of therapy that offers flexion in combination with axial distraction. This form of therapy is an excellent choice for the person suffering from disc pathologies.